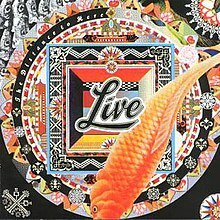 The Distance to Here is the fourth studio album by the band Live, released in 1999. It debuted at #4 on the Billboard 200, selling 138,000 copies in its first week and was certified Platinum by the RIAA on November 19, 1999. All songs written by Ed Kowalczyk, except where noted. Christopher Thorn – rhythm guitar, slide guitar on "Face and Ghost" and "Dance with You"
A^ : "Run to the Water" did not chart on the Flemish Ultratop 50, but peaked at number 17 on the Ultratip chart. ^ Boldman, Gina "Allmusic Review". AllMusic. ^ Weingarten, Marc (1999-10-08). "The Distance to Here Review". Entertainment Weekly. Retrieved 2012-05-02. ^ Powers, Ann (1999-10-28). "Live: The Distance To Here : Music Reviews". Rolling Stone. Archived from the original on 2007-02-17. Retrieved 2012-05-02. ^ Mancini, Robert. "Creed Remains on Top as Live Makes Big Chart Debut". MTV News - October 13, 1999. ^ a b "The Distance To Here > Charts & Awards > Billboard Albums". AllMusic. ^ "Chart Stats entry for Live". ChartStats. ^ a b c "The Distance To Here > Charts & Awards > Billboard Singles". AllMusic. ^ "Ultratop Entry for The Dolphin's Cry". Ultratop. ^ "Ultratop entry for Run to the Water". Ultratop. ^ "Ultratop entry for They Stood Up for Love". Ultratop.